Jesus Christ is returning to cure high cholesterol. Home → Damien Zone → Jesus Christ is returning to cure high cholesterol. “I have to go back and fix this cholesterol mess,” said Jesus Christ as he angrily packed his burlap sack. So, after all these thousands of years waiting for the return of Christ, Christians have to deal with the fact that he is only coming back to fix all the hoopla surrounding cholesterol. And he did. As we continued our interview Jesus Christ pushed a button, entered in some numbers on a keypad, and Myrtle clutched her chest and keeled over at the $4.00 WalMart prescription counter. Myrtle is survived by her long time companion, Bernie Stern, a Manhattan artist and poet, and several nieces and nephews. 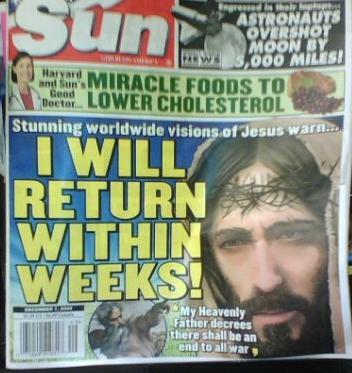 Could Jesus Christ be returning to earth just to cure high cholesterol, or to at least explain it? Could it be as anti climactic as that? Doctors Fear: "Brett Favre needs stem cells to stop accelerated old-aging process." Arsenio Hall offers hope.